Warner is bowled by a full inswinger that also seamed away off the pitch. Not much foot movement from Warner, who was caught on the crease. Broad is rewarded for persisting with a driveable length despite the boundaries in the previous over. [mikeatherton] That was a good delivery from Broad, who continued to pitch the ball up. It just nipped a bit off the surface, Warner played inside it and it pegged back off stump. Watson marches out to the middle to replace Warner and drills his first ball through the covers for four. In contrast to Broad at the other end, Anderson has bowled too short and not given the ball much chance to swing. Rogers picks a couple of runs off his hip past short-leg. England decline to review an lbw shout against Watson despite Broad being keen. Quite right as it hit Watson's huge front pad outside off-stump and was also going over the top. Watson drives for a couple down the ground and collects a single via a thick inside edge later in the over. Bairstow fails to gather a regulation delivery from Anderson cleanly, doesn't inspire confidence in his glovework. Watson works a single to fine-leg. First bowling change of the day, Stokes into the attack in place of Broad. Stokes starts with a gentle half-volley at Watson with predictable results; four runs through the covers. Thereafter Stokes drops his length back and Watson is content to leave alone outside his off-stump. Anderson continues into his sixth over, it's not been his best new-ball spell. Rogers drops and runs on the leg-side to turn the strike over. Watson is again content to plant his front foot way down the pitch and then leave alone outside off-stump. Carberry pulls in another Watson drive just short of the rope, he's happy to drive at anything pitched up. Stokes getting just a touch of outswing to the right-handed Watson. Rankin on for his first bowl in Test cricket. So far @StuartBroad8 is the only bowler to bowl the right length on this wicket ... Full.... #Ashes . The 6ft 8in Rankin starts with three short balls outside Watson's off-stump; the first he swished at and missed, the second climbed alarmingly and the third was toe-ended just short of third slip. Watson picks off a couple of runs off his pads as Rankin over-corrects his line. Not a great start. Good over from Stokes. Better length. First ball jags past Watson's outside edge before the right-hander is in two minds before eventually leaving the next one alone. A bit of bounce from back-of-a-length has Watson awkwardly splicing the ball into the offside. Rankin getting plenty of eye-catching carry but not in full control of his action. Understandable given his lack of cricket and some nerves. Couple of singles to go with a set of four byes wanged past Watson's legs and out of reach for a diving Bairstow. Fifty up for Australia in good time. [wicket}For all that England haven't bowled the right length here, they've now got both openers out bowled. Stokes, unlike Broad earlier, has some assistance. Well a lot of assistance actually as Rogers attempts to pull a ball not really short enough for the shot and bottom-edges into his stumps. Clarke off the mark with a quick single first ball before a second misjudged pull shot in the over. Rogers' got him out, Watson's gets him four as he mistimes the ball powerfully to the midwicket fence. Game's not right. [davidlloyd] It was high risk from Cook to bowl first but it's been a good start from England. 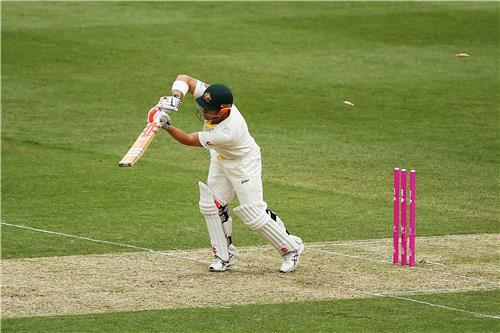 Both Australia openers have gone and Michael Clarke is in early. Stokes and Rankin are bowling at a good pace which is good to see. Clarke looks slightly awkward playing Rankin off the back foot at the start of the over, but is getting in better positions by the end of it and picks up a single to long-leg to keep the strike. Broad back to go at Clarke with three slips and a short-leg waiting for a chance. The wicket almost comes, but via a run-out chance as Clarke takes a dicey run to cover. The ball bounces up perfectly for Carberry to gather and take aim at the stumps, but his throw doesn't find the target. Would've gone with a direct hit. Watson then aims a big cover-drive at a length ball from Broad and makes no contact. Lovely shot from Watson, an uncomplicated clip off his toes that reaches the midwicket fence despite Ballance running round from the square-leg boundary. Couple of good-looking shots from Clarke, pulling Broad through midwicket for four and then punching to cover off the back foot for a single. Broad perhaps overdoing the back-of-a-length stuff against Clarke here. Finn may be the only original member of the England squad not to get a game in this series, but he's still here in spirit as his very own Law comes into play. Stokes has a different technique, using his hand rather than his knee to disturb the bails. As with all batsmen not called Graeme Smith, Clarke is utterly untroubled by the awful distraction of a bail being on the ground and calmly knocks the ball away for a legside single. Watson gets four as he drives a low full-toss straight into the turf and the bounce takes it over the bowler and away to the boundary. Rankin would've cut that off. As too would Finn. Good maiden over from Broad to Clarke. The ball's nipping about a bit out there. England will feel they've not quite been at their best to take advantage of the conditions. Generally too short with the odd half-volley for good measure. [wicket]Second wicket of the morning for Stokes as Clarke's back-foot defence succeeds only in steering the ball to Bell at second slip. Good morning for England now. [nasserhussain] That was the perfect length from Ben Stokes. He makes things happen! It looked like the ball was angling in but it just held its line and was a perfect catching height for Bell. Steve Smith gets a new year gift from Stokes, a friendly half-volley that is pinged away to the cover boundary. Good ball to finish the over, though, as it thuds into the pads. Too high for lbw. Two streaky boundaries for Watson off the returning Anderson. First a genuine edge wide of second slip - would have carried to a third had there been one - and then a top-edged cut shot that just clears gully. Third slip comes in for the last two balls of the over as Cook carefully shuts the stable door as the horse bolts off into the distance. [wicket]Definitely England's session now as England get a first lbw of the series. It's Watson. Of course it's Watson. It's plumb in front of everything, and it's lunch. [andrewstrauss] After winning the toss and bowling England really needed early wickets. Now they have four before lunch, including the Australia captain, it looks like a good decision from Alastair Cook. [lunch]England didn't bowl superbly after choosing to bowl first, but the late wickets of Clarke and Watson have made a huge difference to how lunch will taste for the tourists. It's not the first time it's happened in this series, though, with Australia frequently relying on the Brad Haddin Rescue Act to get them out of trouble. 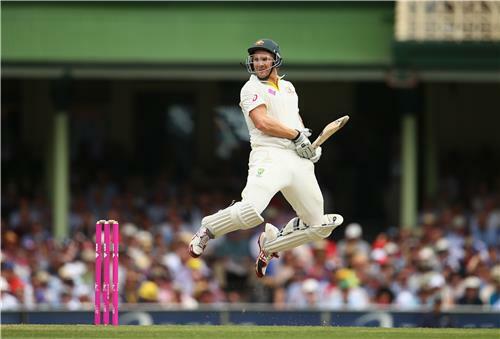 [betting]Australia have drifted slightly to 8/11 from a pre-match 4/6 at Sky Bet after losing those four wickets. The big moves are in the other two options, though, with England in to 7/4 and the draw out to 7/1. Steve Smith is 2/1 to get a 50. George Bailey works his first ball for a single to square-leg as Anderson completes his over to get us under way after lunch. Overhead conditions have improved from a batting perspective during the lunch break, the sun has come out from behind the clouds. Still it remains tough work for the batsmen at the moment, Broad passing Bailey's outside edge twice in a row, both times the right-hander can't resist nibbling outside his off-stump with minimal foot movement. 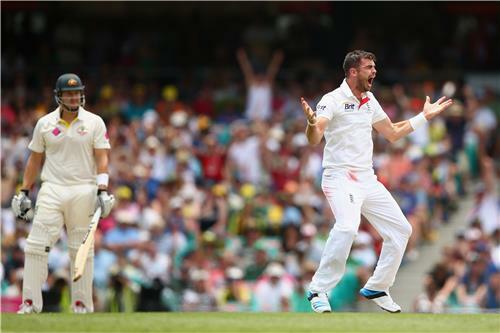 Good start from England's senior seamers after lunch, it is doing a bit off the pitch for both Anderson and Broad. Smith is groping around, hasn't settled yet, although he does collect a couple off his hip to fine-leg.